Like millions of others, on Sunday, I watched the Oscars. One of my favorite parts of the show was when it’s host, Ellen, ordered pizza. A few segments later, she escorted Edgar, a stunned delivery man carrying three pizzas onto the stage. Together, they walked into the audience, delivering greasy pizza to celebrities dressed to the nines. 1. Blending the ordinary with the extraordinary creates special moments. What made this bit funny was the absurdity of ordering (and eating) such an ordinary food on a night designed in every way to be extraordinary. By blending the ordinary with the extraordinary, Ellen created a moment. In the same way, when we in youth ministry blend the ordinary with the extraordinary, we create moments in which God shows up. When, for example, amidst the craziness of a mission trip, we bring an extra lunch to our work site so that we can share a meal with the family we’re serving, God moves. When, in the midst of a fun-filled weekend retreat, we take time to silently gaze at the stars, students experience God in new and profound ways. 2. Hosts connect people. 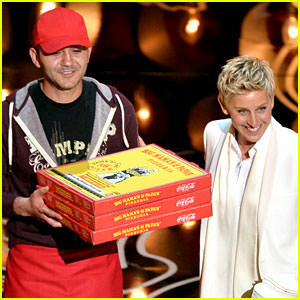 During the Oscars, as they walked around with the pizzas, Ellen asked Edgar, “Who’s your favorite movie star? They’re here. Who do you want to talk to?” The next day, Edgar revealed his favorite movie star was Julia Roberts, who he did, in fact, serve pizza to. In the same way, as the “hosts” of our youth ministries, we are also connectors. It’s not enough for us to simply connect to teens ourselves. Instead, our job is to help teens connect with other adult leaders as well as their peers. In doing so, we help teens form authentic community through which they can experience Christ. 3. Everyone deserves the spotlight. The look on Edgar’s face as he walked onto the Oscar stage was priceless. He was, no doubt, shocked to find himself in the spotlight in a room full of celebrities. Likewise, there are teens in our ministries who never expect to find themselves in the spotlight. Sometimes they don’t think they deserve the spotlight. Other times, there’s no room for them among the spotlight hogs in our ministries. Knowing this, we need to be aware of who in our ministries consistently stand in the spotlight as well as who’s putting them there. Once you’ve become aware of this, widen the spotlight to include others. Look for potential in the kids who shy away from the spotlight. Consistently make space for teens to try new things. Give each kid in your ministry opportunities to discover and use their gifts to glorify God. Combat their inadequacies by speaking belief into them. After all, as children of God, we are all worthy and valued, absolutely deserving of the spotlight.